My name is Sarah McNicholas, but call me McNick! 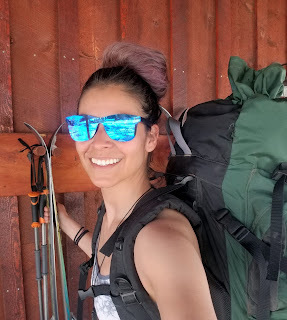 I'm a volunteer from Crested Butte and I've wanted to be on the marmot team ever since I first visited RMBL last summer. I fell in love with the mountains in Gothic and had my eye set on doing field work out here. My experience trapping small mammals with the National Ecological Observation Network (NEON), studying animal behavior in college, and my love of the outdoors has only prepared me for some of what this project requires. I've never cross-country skied before this and now I'm skiing with my amazing team to all of our breathtaking field sites. The marmots are starting to emerge from their hibernation burrows and I can already tell each one has their own funny personality within their social structures. I can't wait to start trapping them to get to know them better. Hands-on field work is super enjoyable for me and I love studying mammals because their behavior never fails to humor me. I feel honored to help contribute to this 50+ years study.